The Supreme Court Monday asked the Central Pollution Control Board (CPCB) to initiate prosecution against government officials who have not acted on 249 complaints received on its official social media and e-mail accounts with regard to pollution in Delhi. 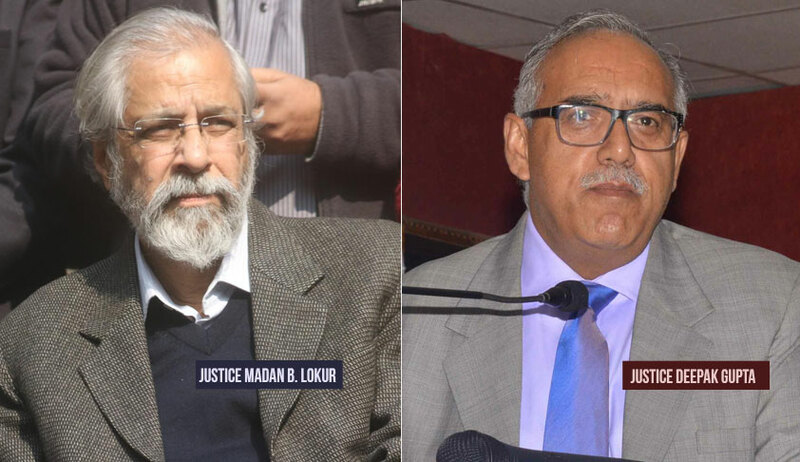 A bench of Justices Madan B Lokur and Deepak Gupta said that officials who have failed to act on the complaints were required to be prosecuted. "Why do not you prosecute these officials? You should prosecute them. Let these people realise what they have done," the bench told Additional Solicitor General A N S Nadkarni, who was appearing for the CPCB. Nadkarni said that from November 1-22 this year, they had received 749 air pollution complaints on their social media accounts and action was taken on around 500 such complaints. Regarding the court's suggestion to prosecute the officials responsible for not acting on the complaints, he said that the CPCB would look into it. The CPCB had on November 1 told the apex court that it has created social media accounts on Twitter and Facebook where citizens could lodge their complaints about pollution in Delhi-National Capital Region (NCR). In an affidavit filed in the court, which is seized of matters related to pollution in Delhi-NCR, the CPCB has said that "of 749 complaints received on social media and e-mails till November 22, 2018, about 500 complaints (67 per cent of the total) were attended by 52 teams of CPCB while associating with clean air campaign during November 1-10, 2018". It further said that the teams continued "similar campaign on its own on November 13 and November 20 exclusively to attend the air pollution complaints received on social media and e-mails. Remaining 249 complaints have been assigned to respective nodal agencies and are in the process getting resolved". It said that in continuation to opening of social media accounts on October 29, CPCB has setup a separate cell for management of citizen's complaints on social media being received through Facebook, Twitter, e-mails and CPCB's website since November 5. "Complaints received at social media accounts namely Twitter and Facebook have to be resolved by respective nodal agencies who are responsible for taking appropriate action," it said. "An efficient mechanism for resolving the complaints through social media can be ensured through respective nodal agencies when they open their official social media accounts and follow the account created by CPCB so that the complaints received at CPCB end can be forwarded to respective agencies. Action taken by agencies can be informed to the complainant on the same platform," the affidavit said. It said that on October 31, an e-mail was sent to the nodal agencies to create their own social media accounts so that complaints received at by CPCB could be attended by them and CPCB had also held four review meetings in November with the representatives of the nodal agencies. It said that as on November 24, 18 nodal agencies have provided their social media accounts to CPCB which included the Haryana State Pollution Control Board, National Highway Authority of India, Delhi Traffic Police, Delhi Transport Department, Delhi Metro Rail Corporation, Delhi Development Authority, Gurgaon Municipal Corporation, Uttar Pradesh Pollution Control Board and the three municipal corporations of Delhi. It said that "between November 1, 2018 to November 22, 2018, CPCB has received 749 air pollution complaints on social media and website accounts which represents 479 complaints from Twitter account, 65 from Facebook and 205 are e-mails/website complaints". The CPCB has said that in order to prioritize action on complaints received through social media, the board has started attending to complaints through its field teams by sending them to locations of alleged air pollution. It said that the CPCB has acknowledged receipt of complaints and also conveyed information on action taken to complainants through social media as well as e-mails. "The inspecting teams of CPCB have taken spot measures such as dousing of fire by calling fire-tenders, covering of construction material, instructions to responsible persons, issuance of challans etc during the campaign. Some complaints were also lodged on Sameer App for necessary action by nodal agencies," it said. Sameer App provides hourly update of national air quality index (AQI). "As on November 23, the Twitter handle received 737 tweets and is being followed by 1,441 people with an outreach of 1.42 lakhs while the Facebook page has an engagement of 1,872 people with an outreach on 44887 and 419 followers," it said. It further said that as per analysis of complaints during clean air campaign, highest number of air pollution incidents relates to construction and demolition activities, followed by burning of waste, road dust, unpaved areas/roads, traffic congestion and industrial emissions. CPCB has also said that based on feedback received from clean air campaign, chairman of the board had issued directions under the provision of the Environment (Protection) Act, 1986 to various nodal agencies including the local authorities in Delhi-NCR responsible for control of air pollution incidents. "Show cause directions were also issued to nodal agencies indicating the intent to initiate criminal prosecution under section 15 of the Environment (Protection) Act, 1986 in case of failure to act in controlling air pollution incidents," it said.